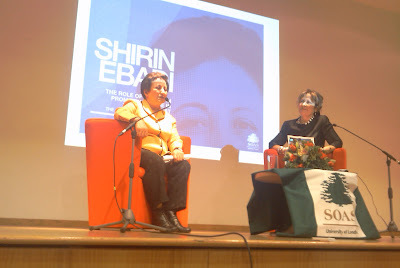 On Wednesday 2nd February, 2011, Nobel Laureate Dr. Shirin Ebadi presented a very eloquent and inspiring speech before a packed Brunei Gallery at London's SOAS University; the event was titled "The Role of Women in Promoting Peace in the Middle East". Dr. Ebadi spoke in Farsi, and her words were translated into English by an interpreter. The president of SOAS University, Baroness Helena Kennedy QC, introduced Dr. Ebadi as the "heroine", and "champion of human rights". Dr Ebadi took her place at the podium and delivered her speech on democracy and the feminists' struggle for women's rights. The Nobel Laureate rightfully asserted that democracy and women's rights are complementing scales to be balanced; that democracy cannot truly be honoured when there remains gender discrimination. "Given that the oppressive IRI government has repeatedly refused to ratify the key international instrument of law on women's rights (Convention on the Elimination of all forms of Discrimination Against Women), do you think they deserved their seat on the United Nations' Commission on the Status of Women?" She began to answer by arguing that the IRI did not make it onto the United Nations (UN) women's rights body because Timor Leste managed to put in a last minute bid to take the seat. I realized that the Nobel Laureate had confused the recent activity of the UN Entity for Gender Equality and the Empowerment of Women (a.k.a. 'UN Women') with the very different UN body of the Commission on the Status of Women (CSW) that I was referring to, and so I immediately attempted to clarify that the two organizations are distinct and that the IRI were elected and still have their seat on the CSW. My attempts were futile as she demonstrated a distasteful display of authoritarian behaviour by refusing to give me the chance to clarify the point in question by raising a palm and sternly commanding me to 'stop'; to which the misandrists in the audience enjoyed a laugh and provided the 'champion of human rights' with an applause. I was certain that the 'CSW' is a distinct UN organization from 'UN Women', given I, with the help of my Coalition members, have established a UN Side Event on the CSW vs the IRI at the UN Building in New York, which is due to take place on the 3rd March, 2011. However, in according Dr. Ebadi with the 'benefit of the doubt', when I arrived home I telephoned the Economic and Social Council of the UN in New York and obtained confirmation that the two organizations are in fact distinct and that the IRI's membership of the CSW is not affected by their rejection from joining UN Women. Dr. Ebadi then addressed another member of the audience's question. In doing so, she illustrated her point by expressing why States are reluctant to send UN Special Rapporteurs to Iran. She based her argument on the 'fact' that "there are many States that have a worse human rights record than Iran", to which her translator mistranslated into English 'there are countries whose human rights records are "no better" than Iran'. This was a very shameful use of words coming from such an esteemed human rights "champion" and Nobel Laureate. It has been consistently proven that the government of the Islamic Republic of Iran are responsible for the worst human rights record in the world per capita; there are no other 'countries' that can rival the IRI on this basis. Dr. Shirin Ebadi, who throughout her eloquent presentation argued how the IRI is an appalling example of democracy, and how its Constitution humiliatingly subjugates the rights of women, expressed what can only be described as 'ignorant' behaviour. She was given the opportunity for clarification on the distinction between the 'CSW' and 'UN Women'; however, she was defeated by her arrogance, then proceeding to belittle the reprehensible human rights record of the IRI. How are the soldiers of gender equality going to feel when they realize that Dr. Shirin Ebadi has failed to recognize that the oppressive, misogynistic government of the IRI have a seat on a key international women's rights body? What is to be said to the 'Mourning Mothers' who convene in Iran's parks, silently staring as they hold pictures of their murdered children? Dr. Ebadi's slip could be interpreted as a reckless strike against the unrelenting efforts of the true human rights activists in Iran, as well as those who are outside the country, who are endangering their lives and their families' safety in furthering the cause of gender equality and other human rights. I certainly hope that Dr. Shirin Ebadi realizes her error and learns from it, as I too will have learned a valuable lesson from this evening. This is not the first time for her. I was there and thought she was a bit condescending but thats how it is with high profile characters! Better get used to it! By her rude and very manipulative, controlling way she mishandled your perfect question, she proved what this quote expresses....she denied your individual right to express a concern by not only stopping you, but also promoting an unjust mockery. So, in essence, she really isn't a "defender" of human rights (women's or anyone's)...she is just a misinformed demogogue on an uninformed platform. I hold no respect for her. Let reality be your final arbiter; since you are right, she will learn it eventually and hopefully become profitably wiser. Hhhmm....not good - do you believe she's hostage to threats to family members still inside Iran? I understood that Ms Ebadi did not act in an appropriate manner. I am sorry that you had to suffer through her misinformation. This said, if I were you, I would send her some literature pertaining to the difference of these organizations & I would let this slide over my shoulder. Ms Ebadi is burdened with many Human Rights cases & also many threats to hers & her family members. I think we need to let this mistake go & hope she will read the literature you send her & she will educate herself. ebadi, is an agent of the unlawfully occupied regime in our beloved Iran, this fact has been known from her manipulative manners, when she is asked a key question about human rights in Iran(and similar questions as yours tonight) and misinforming the world about whats happening in Iran. She is always extremely rude and ignorant(every time she opens her mouth). I will post you some of her comments she made about "how things are much better for women in Iran now!! !, than it was before this monstrous regime occupied Iran!!!!! PS: ebadi is not expert in human rights. Well, if you ask me, her 'distasteful display of authoritarian behaviour' was a response to your arrogant way of talking. No offence but sometimes you really come across as a presumptuous prick. Couple that with the fact that she thought you were wrong and her reaction will seem quite natural. Also your walking out was not very appropriate, regardless of whether you disagree with her on that point, though I can perfectly understand you were fed up with all of it by then and I can imagine how you felt inside. Don't worry about the crowd though, or how big the auditorium was. Injustices like that happen all the time in life and luckily for you, you have a blog where you can let it all out and prove your point. And as has already been suggested, you should also inform Dr Ebadi about the truth of the matter. I would further suggest re-writing this post, and sticking to the facts, without lowering yourself to making remarks on Dr Ebadi's 'behaviour' and vilifying her. You need to lose the stuck up pose way more than she does. I would like to ask for elaboration - how was I 'arrogant'? I commenced my question by thanking the organizers of the event and expressing what an honour it was for me to be present? Presumptious? I merely asked whether the Nobel Laureate thought the IRI deserved their seat on the CSW...If she thought I was wrong, she still could have demonstrated a little humility. Her ego got the better of her. I walked out because I was appalled at how she belittled the human rights situation in Iran, after demonstrating limited knowledge in 'her field'. There is no 'stuck up pose', only a justified belief in one's conviction. She's pissed me off ever since she was awarded the Nobel prize, wouldn't have cared as much if she didn't have that award. While she has defended many victims through out her career (got paid for them of course) and brought global attention to the individual cases, but in action she's always opposed the most logical solution to the HR crisis inside Iran: regime change and democracy. She has always said that her mission is to establish HR under the current constitution and legal framework of IRI which is totally impossible to achieve. A person who lives in Europe with a Nobel prize is untouchable and if is not brave enough to advocate the right solution, she doesn't deserve to have such important prize in the first place, it's like awarding a war medal of honor to a military general who never fought a real war and scared to fight one, only worked as trainer and non-combat operations! Due to her lack of presence in any of the protests after the rigged elections and her unwillingness to use her high profile to return to Iran and face the regime in person, I found her quite useless. Thank you, Mr. Moser. I appreciate the contribution and link provided. Your blog on the Nobel Laureate provides a compelling and informative read; some enlightening facts that re-enforce my views after last night's event. "Ms Ebadi is quoted as saying: “Any person who pursues human rights in Iran must live with fear from birth to death, but I have learned to overcome my fear.” – It must be terribly fearsome to have to live in London and enjoy personal and political freedom, while in Iran thousands haven been imprisoned for political dissent and 47 prisoners were executed in the first 2 weeks of 2011 alone."